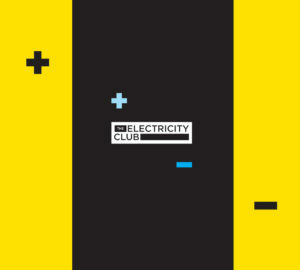 So it’s important to differentiate and the makers of Synth Wave Live did just that with their smaller scale, but no less ambitious event, Synth Club at Electrowerkz in the heart of London. Centred around a formal album launch of ‘Dichromat’, the excellent third album by Hungary’s BLACK NAIL CABARET, the evening was bolstered by an impressive line-up that also included VILE ELECTRODES, KNIGHT$, THE FRIXION and THE DEPARTMENT. 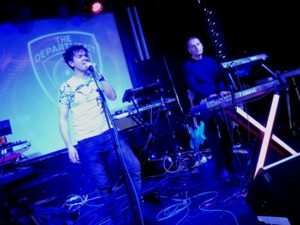 THE DEPARTMENT took the opportunity to premiere some new songs, as well as playing fan favourites like ‘Glass Houses’ and ‘Slow Down’. While their only album so far ‘Alpha’ showed some flashes of promise, their newer material points towards a strengthened sound with a more cinematic presence. ‘This Be The Verse’ inspired by the Phillip Larkin poem and ‘About A Boy’ both benefited from Rob Green’s enthused on-stage delivery. Meanwhile, new pairing THE FRIXION are an interesting proposition. Originally a side project of MASSIVE EGO’s Lloyd Price, this duo featuring the rich and stellar vocals of Gene Serene could not be more different to the alternative eyeliner punk combo signed to Out Of Line. 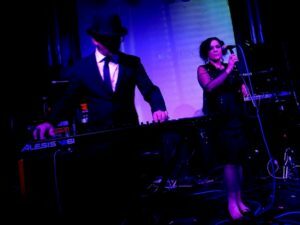 For their first ever live performance, they began with ‘Don’t Think About It 2 Much’, a fine introduction to their dark but accessible electronic pop. This was followed by the danceable ‘If U Ever Wonder’ which captured a feeling of space within Price’s inventive arrangements. As a tribute to the passing of The Purple One, Serene introduced her touching take on ‘Under The Cherry Moon’. 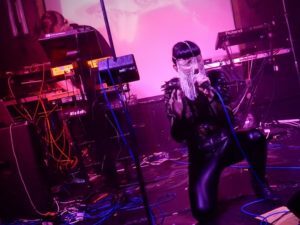 And with the recent single ‘From Dusk ‘Til Dawn’, THE FRIXION exerted their brooding musicality before finishing with ‘Heartbroke Disco’ and leaving the Electrowerkz crowd wanting more. After all the darkness, some light was let in courtesy of KNIGHT$, the new vehicle for former SCARLET SOHO frontman James Knights. It’s been an interesting time for Londoner, with him also acting as lead vocalist for the current incarnation of cult German electropopsters BOYTRONIC. Shiny pop is very much the ethos of KNIGHT$, but underneath that skin are hidden layers as proven by the opening song ‘Uncivilized’, originally recorded by Canadian darkwave trailblazers PSYCHE. Meanwhile ‘Cards On The Table’ came over like a poptastic IAMX. James Knights is a natural crowd pleaser and the loose electro-funk of ‘What’s Your Poison?’ was particularly well-received. A rendition of SCARLET SOHO favourite ‘Gigolo’ was a reminder of a song that would have been a hit 30 years ago, while a straightforward cover of an actual hit from almost 30 years ago in the shape of PET SHOP BOYS ‘Heart’ completed half an hour of innocent synth assisted fun. 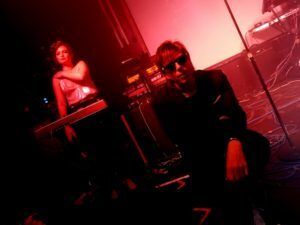 Since BLACK NAIL CABARET’s last London gig in 2015, the duo’s line-up has changed with Krisztian Arvai taking over the keyboardist’s role from Sophie Tarr. But charismatic front woman Emese Arvai-Illes remains, with her hybrid of Siouxsie Sioux and Billie Ray Martin being the key that has drawn in admirers from around Europe following support slots for CAMOUFLAGE and COVENANT. 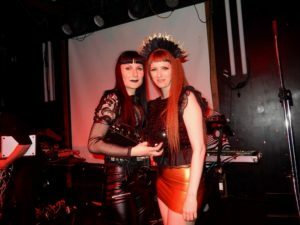 Beginning with ‘Sister Sister’ from ‘Dichromat’, Illes-Arvai adorned a chainmail veil and noir leather in a live presentation that befitted the BLACK NAIL CABARET name. ‘(The Critical Cult of) Dora’ added some gothic R’n’B to proceedings while ‘We Like To Suffer’ and ‘Therapy’ highlighted the strength in depth of their third album. However, it was ‘Satisfaction’ that drew the biggest cheers of the set while a new uptempo reboot of early single ‘Veronica’ concluded a fine performance. Like BLACK NAIL CABARET, VILE ELECTRODES haven’t played live in London since late 2015. The intervening period has seen Anais Neon and Martin Swan release their second long player, the wonderfully bleak ‘In The Shadows Of Monuments’ which featured a ghostly cameo from a certain George Andrew McCluskey on the epic closer ‘The Vanished Past’. Bringing the desolate mood into a concert setting, the duo opened with the almost skeletal ‘Like Satellites’ before thundering into the sophomore album’s percussive title track, complete with sharp cuts of stroboscopic lighting. To lighten things up slightly, the more accessible ‘Empire Of Wolves’ allowed Swan to put his new Behringer DeepMind 12 through its paces. Meanwhile, Neon stuck with her trusty Roland RS09 and used its eerie string preset to great effect on what has become VILE ELECTRODES signature song ‘Proximity’. ‘The Red Bead’, ‘As We Turn To Rust’ and ‘Incision’ from ‘In The Shadows Of Monuments’ all ensured things remained enjoyably artful and stoic. 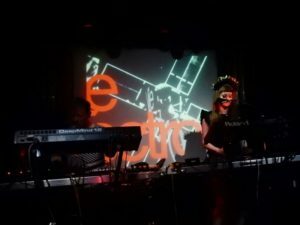 This edition of Synth Club was a fabulous evening of electronic entertainment that gathered some of the best independent synth acts from Europe; while all different, they successfully managed to complement each other.